Take in the peace and quiet of winter snowshoeing or hiking at beautiful Mt. Ashwabay. 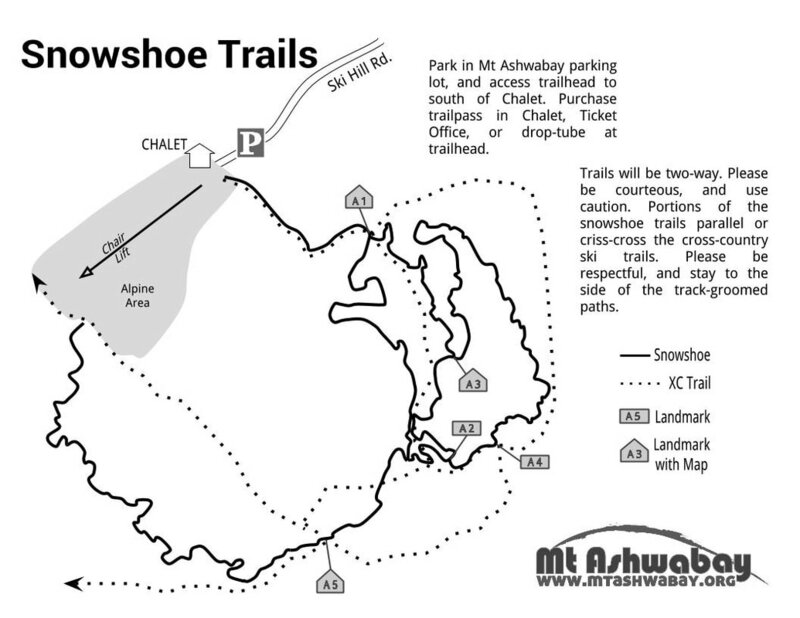 Enjoy our designated Sugar Bush Dog Trail for snowshoeing. Hikers are welcome to use all cross-country trails when not being groomed. Hikers with trail pass allowed on all nordic trails when not being groomed (dogs allowed on Sugar Bush Dog Trail with appropriate pass). Two-way trails. Please be courteous and use caution. Portions of the trail share cross-country ski trails. Please be respectful and stay to the side of the track-groomed paths. Nordic trail passes are required for skiing, snowshoeing, or hiking. Purchase a trail pass in the chalet or use the drop-tubes located at each trailhead. Snowshoes are available in sizes 21-36. The bindings adjust to work with most winter boots. Prices are per day. Multi-day rentals available. Our trail system is designed, built, and maintained by volunteers. Do you have a great idea? Want to pitch in and be part of the Grooming Crew? Contact our team at the hill.